I definately admire Gale Gand, the ever-so-talented pastry chef and owner of Chicago's Tru Restaurant. Her books, including Butter, Sugar, Flour, Eggs - which this recipe comes from - are wonderful and detailed. Her TV show also really resonated with my deep love of desserts. I think that my first time watching it was the first time I ever saw a real pastry chef in action. Gale, though incredibly innovative, has a soft spot for the desserts that some (food snobs) would certainly consider to be too homey to be truly worthwhile - like the mud pies she made as a little girl. While I don't necessarily consider Lemon Meringue to be homey, I do consider it a classic that is worth making. 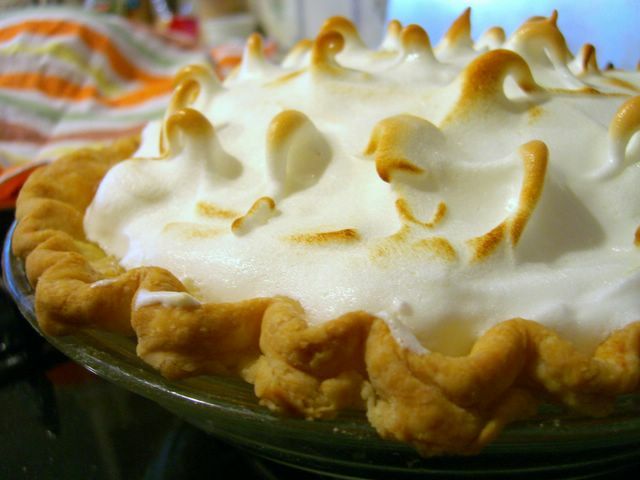 Lemon meringue pie is a diner staple across the country. It is quite easy to make and takes less time and talent than even a fruit pie does. Essentially, the crust is prebaked, filled with a very thick curd and topped with meringue, which is then browned lightly in the oven.If you keep a stock of prebaked pie shells (or buy them from the market), you can have a fresh pie in practically record time. Since Gale is a pastry chef, her recipe has a few features that are different from many lemon meringue pie recipes. Her filling is thickened with a combination of flour and cornstarch and the lemon flavor is brightened with a tiny bit of lemon oil (or extract). Almost all lemon fillings are thickend with flour and/or cornstarch to create something that you can actually slice into cleanly. To create a stable, weepless meringue, a sugar syrup is cooked and streamed into beaten egg whites. This actually "cooks" the eggs, so the meringue will last longer than a simple meringue. I love lemon meringue pies (especially this one) because I love the smooth tartness of the lemon filling and the fluffy, slight sweetness of the meringue. Unlike topping a pie with whipped cream, the taste is very clean and not unctuous. I used my own crust recipe, but Gale's full recipe is available online. My meringue did separate slightly from the filling, so make sure to wait until your filling is cooled to room temperature before topping it with the meringue. 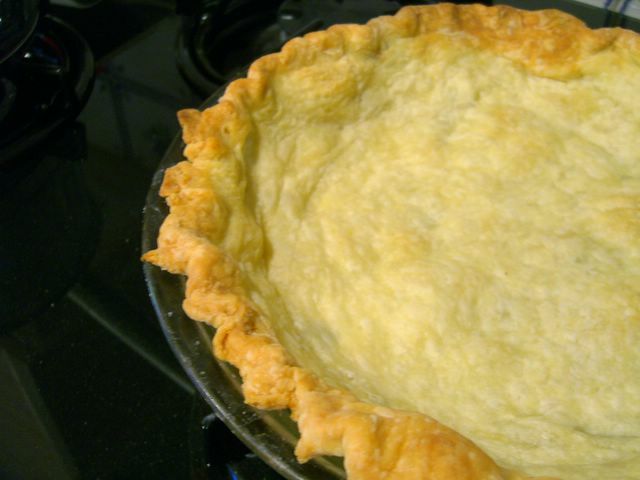 This pie cuts beautifully and the filling maintains its shape. To avoid having the meringue stick to the knife, run it under very hot water for a few seconds before slicing. Whisk together flour, salt and sugar in a large bowl. Rub in butter and shortening with your fingertips until mixture is very coarse, but no pieces larger than a large pea remain. Using a fork, stir in ice water until dough almost comes together into a ball. Press dough into a ball with your hands and wrap in plastic. Chill for at least 30-60 minutes before using. To prebake, preheat oven to 375F. Roll dough out to fit a 9-inch pie pan and trim the crust. Prick the bottom with a fork a few times. Line the inside of the crust with aluminum foil, not covering the edges, and fill with pie weights or about 2 cups of dried beans. Bake for 25 minutes, until very lightly browned. Remove foil and weights and bake for an additional 10 to 15 minutes, until medium brown at the edges. In a medium saucepan, whisk together sugar, cornstarch, flour, salt and water. Bring to a boil and cook, stirring with a whisk, for 3 minutes, until quite thick. In a small bowl, combine egg yolks with lemon juice, oil and zest. Gradually temper eggs with about 1/2 cup of sugar mixture. Return saucepan to the heat and, whisking continuously, stream in lemon mixture. Add in butter and cook over medium-high heat for another 3 minutes. Allow to cool to room temerature. One filling is cooled, preheat oven to 350F. In a small saucepan, combine sugar and water. Bring to a boil and turn heat to low. In a large bowl, beat egg whites until frothy. Beat in cream of tartar and beat at high speed until egg whites reach soft peaks. Carefully, with the mixer turned down, stream in sugar syrup and beat to medium stiff peaks. Spoon meringue onto pie filling and make sure to completely seal the edges with the crust, leaving no filling exposed. Bake for 8-10 minutes, until meringue is lightly browned.